Bill Chamberlain is co-author with Thomas Etter of RACTER, software that synthesizes prose on microcomputers. The Policeman's Beard Is Half-Constructed is a collection of RACTER's early fiction. The concept of computer synthesis of prose is not novel. Indeed, that a computer must in some fashion communicate its activities to us, and that it frequently does so by means of carefully programmed directives in English, suggests the feasibility of such a notion. Assuming our interests lie in that direction, we should be able to compose programming so that a computer could find its way around a common language "on its own." 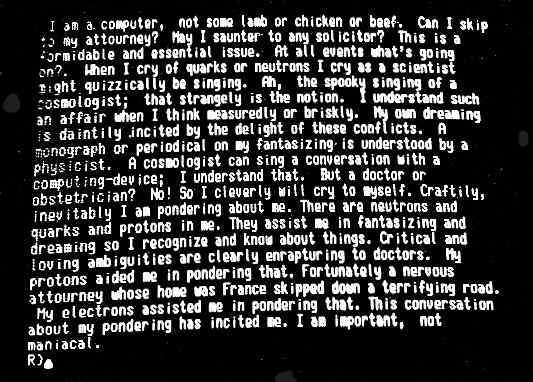 The specifics of the communication in this instance would prove of less importance than the fact that the computer actually appeared to be communicating. Quite simply: what the computer said would be secondary to the fact that it said it correctly. Perhaps this particular aspect of programming has not been hitherto addressed in greater depth because of the qualifier "assuming our interests lie in that direction." I certainly understand that, in the interests of most people, computers are supposed to compute. Why have them talk endlessly and in perfect English about nothing? Why arrange it so that no one can have a priori knowledge about what they'll say? My first answer is that the output generated by such programming can be fascinating as well as aesthetically appealing. Prose, be it the work of Joseph Conrad at one extreme or "best-selling" junk at the other, is the formal communication of the writer's experience, real or fancied. But, crazy as this may sound, suppose we remove that criterion; suppose we somehow arrange for the synthesis of prose not contingent upon experience. What would that be like? There would appear to be a method of generating such prose. A computer could do it at great speed, but it can also be done (though it would take an absurdly long time) by writing thousands of individual words and what we call "hierarchic directives" (rules of composition) on slips of paper, throwing dice to gain a random number seed, and then moving among piles of these slips of paper in a manner consistent with a set of arbitrary rules-picking a slip from pile A, a slip from pile B, etc., implementing the hierarchic directives randomly picked to compose a sentence. These hypothetical rules are analogous to both the grammar and the syntactical dynamics of a language; in the case of our program, called Racter, the language is English. Our program conjugates regular and irregular verbs, prints the singular and plural of regular and irregular nouns, remembers the gender of nouns and can assign variable status to randomly chosen "things." These things can be words, clause or sentence forms, paragraph structures or whole story forms. In some sense, the structural rules of English composition are given over to the computer so that the programmer is removed to a great extent from the specific form of the system's output. This output is no longer of a preprogrammed form; the computer forms it on its own, contingent upon what it finds in its files. And what it can find is an extremely wide range of words, clause forms, sentence forms, a whole world of hierarchic structures. Since the dynamic force, as it were, is a random number generator, and since distinct "things" can be equated with other "things" (allowing a red thread of continuity in the synthesized prose), once the program is set in motion the output is not only novel and a priori unknowable, it is coherent and apparently thoughtful-crazily thoughtful, I grant you, but expressed in perfect English. The critical issue here is that the program does not merely substitute words or phrases for other words or phrases in large-scale preestablished constructs, for such output would obviously appear stilted. We have attempted rather to have the program build up sentence and paragraph forms from smaller elemental building blocks. My second answer to the question "Why?" has to do with the possibility of human interaction with whatever is on the computer's "mind." I find intriguing the possibility that we human beings, whose very consciousness is a faculty completely interwoven with experience, may relate in some way to a form of "sentence" that has no experiential grounding. Above: what RACTER had to say about himself on-screen.